If you’re looking for an event at which to sell your pre-loved goods, look no further! 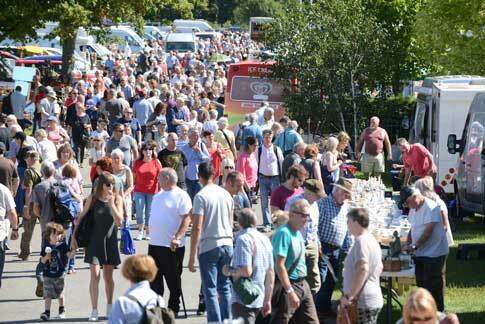 Our Malvern Flea & Collectors Fair is hugely popular – earning its status as the largest flea fair in the UK. Be part of the ‘Malvern magic’ and book your place now. Must be pre-booked by the end of the week prior to the fair. After this time, tables will be £8 each, subject to availability. *Vehicles larger than a standard transit van must book a minimum of 30ft. CANCELLATIONS - Cancellations of bookings after the payment date (see booking form for details) will incur charges. Download our Terms & Conditions for details. -	8ft pitch with one 6ft table, leaving 2ft access to the rear of your stand. -	Two chairs per stand. -	Electrical supply (it is advisable to bring an extension lead and your electrics must be PAT tested). -	A shed where you park your vehicle undercover and unload next to it. Download our Malvern Flea 2019 booking form, which has the new prices for 2019. Simply, print it, complete and return to us by post, making sure you have included payment details and taken note of the payment processing date. Alternatively, call the team on 01 636 676 531 and your booking can be taken over the phone. Sunday/Bank Holiday Mondays: 7:30am – 3:30pm, £5pp. 6:30am	- showground opens, cars allowed to park around the building. 7:00am - building access to set-up. 7:00am - entry to showground to park in the building. Spaces allocated on arrival only. For queuing please try not to arrive before 6:00am. There are no facilities for overnight parking. Between Oct-Feb vehicles will be directed to a pitch at 7:00am. Between Apr-Sept this will be from 6:30am.